Happy October! I’ve gotten out some of my fun Halloween pans and cookie cutters to make some new ghoulish goodies. 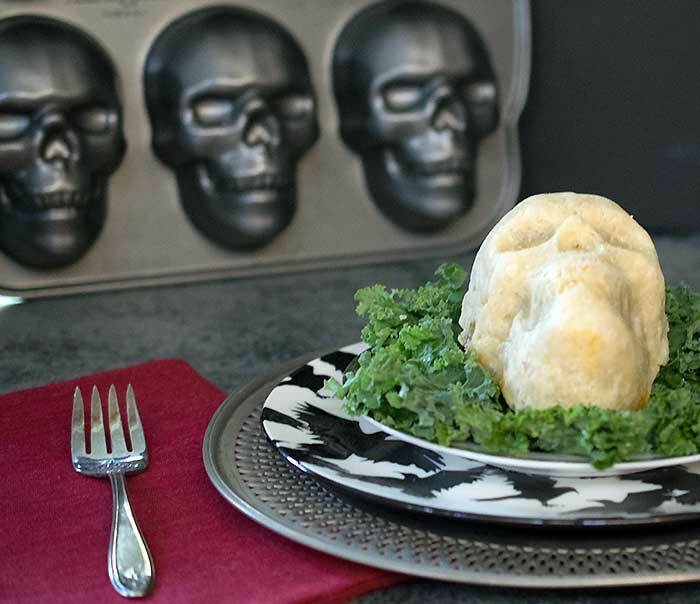 Today I’m sharing my recipe for Spooky Skull Vegan Pot Pies. Honestly, it’s the best pot pie I’ve ever had, so you need to make this even if you make a plain pie. Just so you know, this is another post in my series of recipes sponsored by the Idaho Potato Commission. Vegans can never have enough potato recipes. Get more Halloween recipes on the blog here, or in my ebook, The Ghoulish Gourmet, get the Kindle version at Amazon. 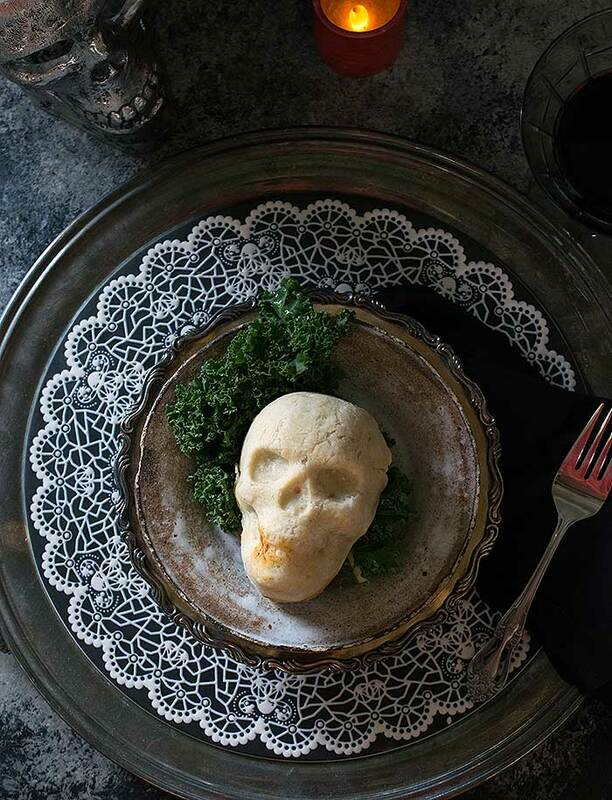 I used Nordic Ware’s Haunted Skull Cakelet Pan and this recipe makes enough dough for the pan. You could use another skull pan or even Nordic Ware’s Mini Pumpkin Pan if you’d prefer to keep it fall themed. If you don’t have a new fancy pan in your budget, just make a regular pie. It will taste just as good and you can still make it spooky too. I used a skull cookie cutter to cut out the crust for the top and just used a straw to cut out the eyes and a knife to cut the mouth. It’s still spooky! When you make the coconut oil crust you’ll cut the oil into the flour until it looks like the picture below. I use an OXO pastry cutter, but you can use 2 knives or a big fork. 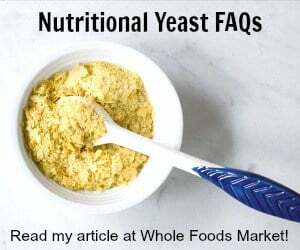 I know I’ll get this question – how do I make this without oil? I have made a crust with yogurt, salt and flour, but it’s not flexible enough to use in the skull pan. Instead, make the stew without the oil and serve over some whole grain toast. I know it’s not exactly the same, but you can cut out some cats out of dark pumpernickle bread and it’s just as festive. 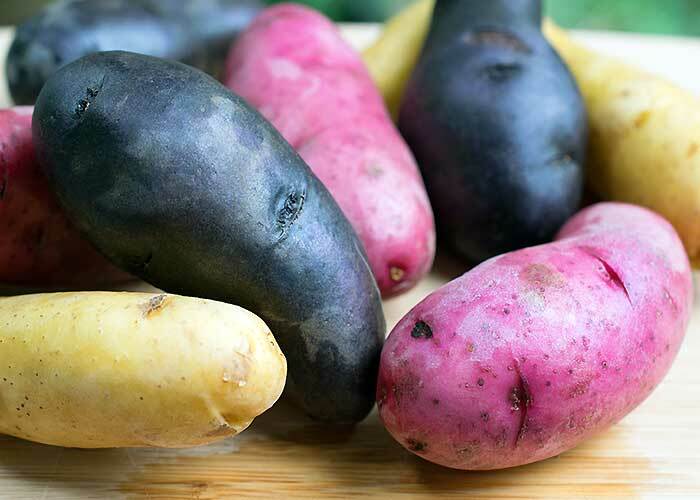 When you think of Idaho® Potatoes you may not think of fingerlings. But I assure you these beauties are from Idaho and they are delicious. 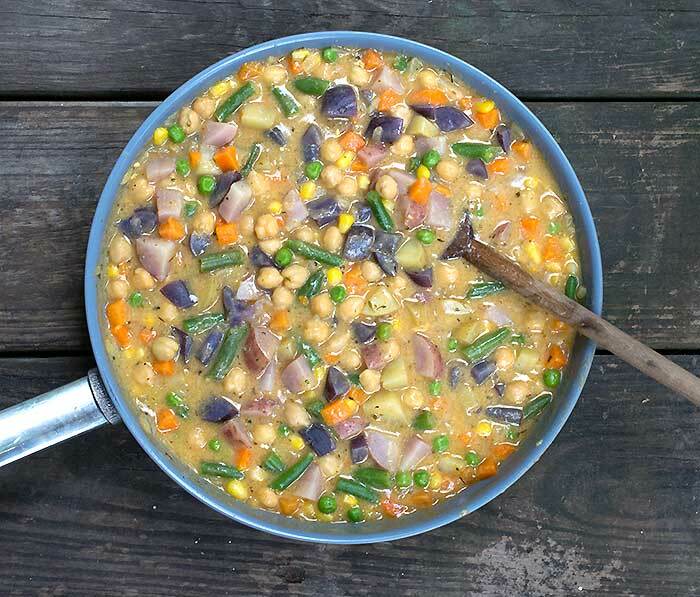 I love using a mix of colors to brighten up soups or stews. 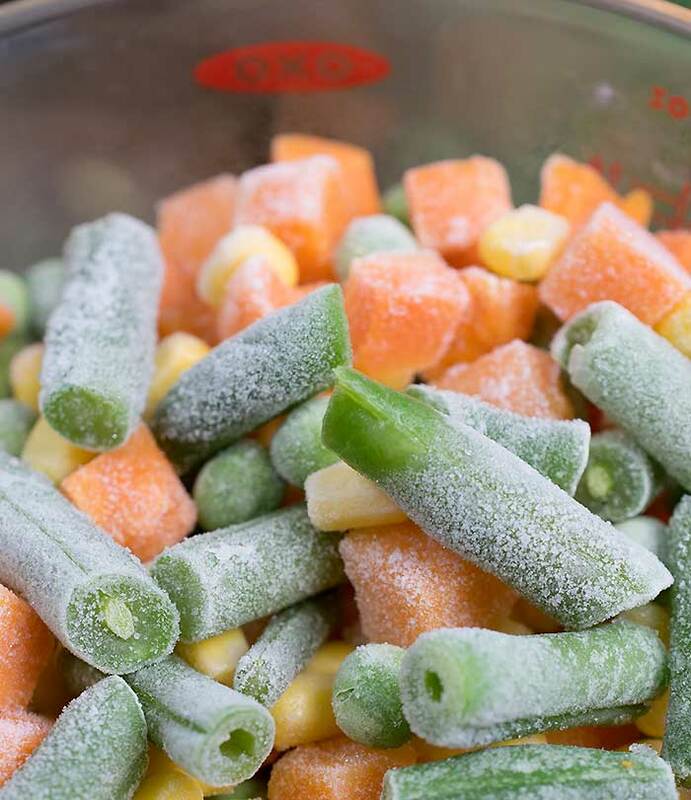 The other piece of our pie is a bag of frozen mixed corn, peas, carrots and green beans. You can use fresh if you want, but I wanted to make the filling easy. And you can see the stew below. It’s almost a little sad hiding it away inside a pie crust, but the two together taste amazing. But no one will ever know if you just eat it as a stew. 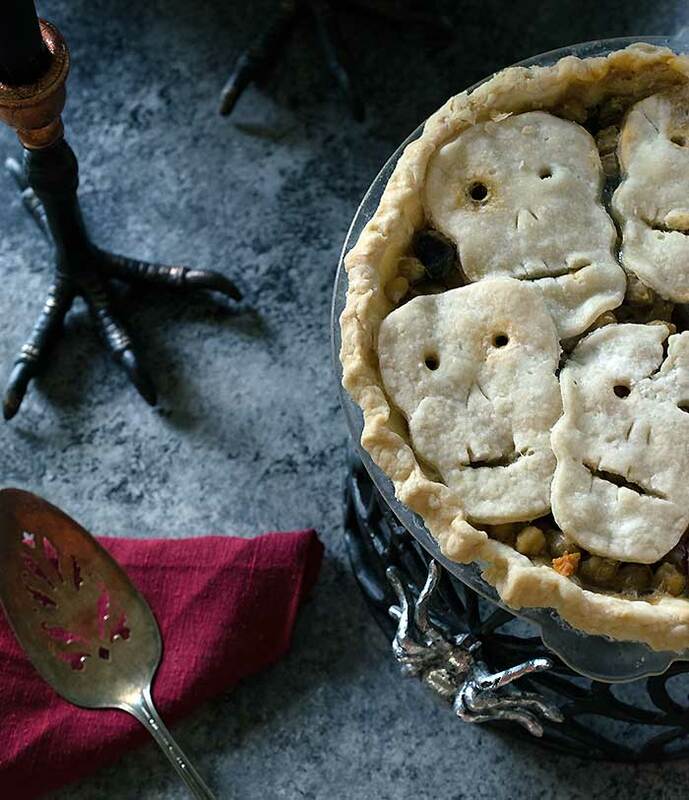 Halloween dinner will be the spookiest ever with these little skull vegan pot pies. If you can't find the molds, don't worry. Just make it as a double crust pie. I made the top crust with a skull cookie cutter and carved in the features. Make it anytime - it's not just for Halloween! 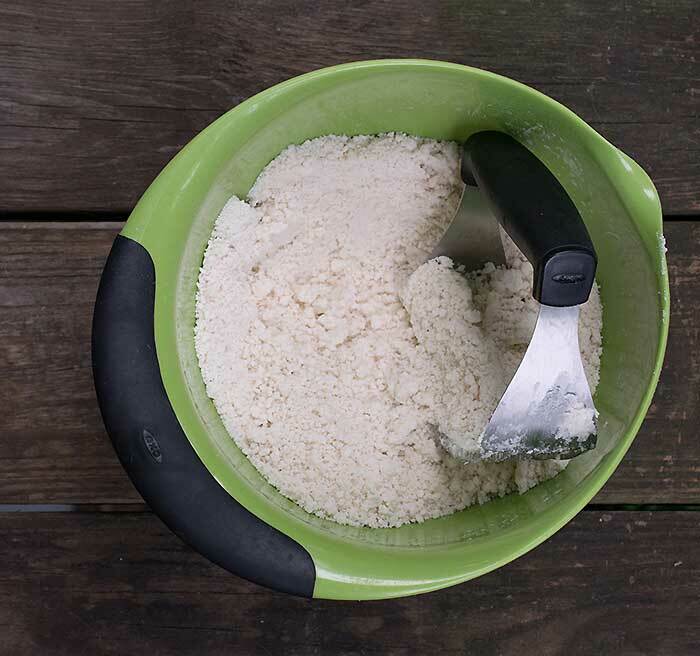 Make the Dough:Mix the flour and salt in a mixing bowl. Add the coconut oil and cut the oil into the flour using a pastry cutter, 2 knives, or a fork. It will be ready when it looks like sand. Add the vodka and water. Mix the dough with your hands. If it's too dry to stick together add more water a tablespoon at a time until the dough stays together, but isn't too wet to handle. Make a ball with the dough and let it chill in your fridge for about 1 hour. Make the Stew:Heat the oil in a large saute pan over medium heat. (You can water saute to make the stew oil-free). Once hot, add the onions, salt, and rosemary then saute until translucent. Add the garlic and saute another 3 minutes. Sprinkle the flour and nutritional yeast over the cooked veggies and saute for a minute. This will allow the stew to thicken later. Add the frozen veggies, water, marjoram, thyme, smoked paprika, and black pepper and turn the heat to high. Cook, stirring often until the veggies are hot and the stew begins to thicken. Add the cooked potatoes and chickpeas and heat for a few minutes more until they are piping hot. Take off the heat and set aside. Make the Pies:Preheat your oven to 350 degrees. Spray the skull pan or pie plate with oil. Mini Skull Version:If you are using the mini skull mold, divide the dough into 6 equal pieces. Then reserve about ⅓ of each dough ball. Roll out the remaining ⅓ dough to make a top for the filled skull mold. Pinch the edges together so that the stew doesn't leak out. Poke a few holes with a fork to let the steam escape. Bake for 30 minutes, then check on them to get an idea of doneness. You are looking to see if it looks slightly brown and the dough does not seem oily. Then bake for 10 to 15 minutes more. Let cool before you try to remove the pies from the mold. The easiest way to unmold is to place a clean cutting board on top of the mold and then flip them both over so the pan is now resting on top of the cutting board. Gently pull up on the mold and most of the pies should come right out. If any skull does stick, use a knife around the edges and try to unmold again. Full Pie Version:If you are making one large pie divide the dough in half. Roll out the first half of the dough and carefully transfer it to your pie plate. Make sure that the dough hangs over the edge a bit. Roll out the other half of the dough to use as your top crust. You have 2 options for the top crust. 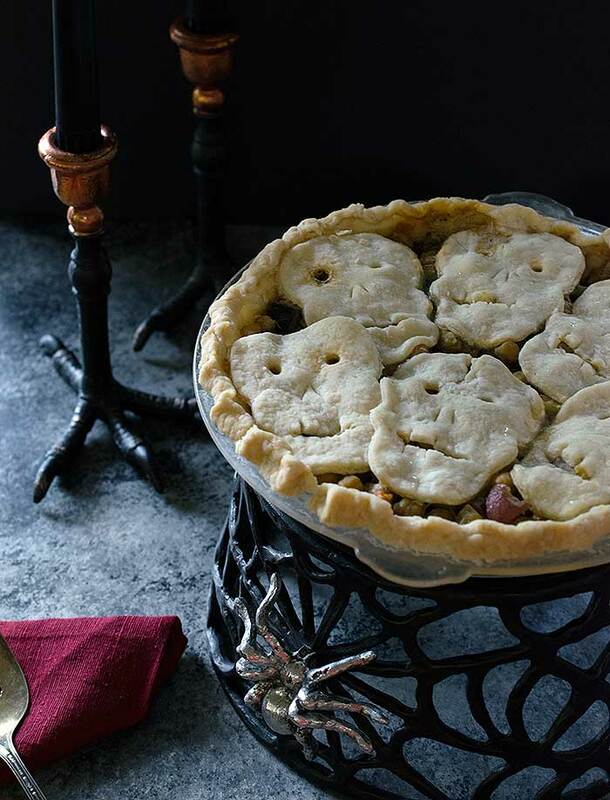 Either put the whole top crust on top and pinch the edges together so that the stew doesn't leak out or cut out skulls or ghosts with cookie cutters and place around on the top of the pie. Poke a few holes with a fork to let the steam escape if you are using a whole top crust. There will be spaces for the steam to escape if you use cookie cutter, so you don't have to poke holes. Bake for 60 minutes, then check on them to get an idea of doneness. You are looking to see if it looks slightly brown and the dough does not seem oily. Then bake for 10 to 15 minutes more. This is so cute and creative. I want to host a Halloween Party just so I can make these! Is the vodka necessary? Anything I can sub for this ? It makes the crust a little better, but you can totally leave it out if you don’t have any. The crust will be fine without it. THANK you for the prompt response! Should I use extra water if I don’t use the vodka?